BLOOMFIELD - The 10th-ranked Berlin football team has now shut out five teams this season, but no one would have thought it would upset, let alone shut out No. 9 Bloomfield Friday evening 37-0. Mistakes plagued Bloomfield. The Redcoats forced four turnovers, all from intercepting Warhawks’ quarterback Daron Bryden. The sophomore signal caller was a big threat going into the game, but as the night unraveled, not so much. Berlin’s Tony Undercuffler intercepted two, while Marco Scarano and Larry St. Pierre each came away with one. Once the ball was turned back over to Berlin’s offense, it was almost an immediate score each time. Just three plays after Undercuffler’s first pick, Scarano ran 46 yards, completely untouched, into the end zone with seven minutes to go in the first half. The Redcoats opened up the second half strong, leading 28-0, when Undercuffler intercepted Bryden for the second time. Berlin found itself 31 yards away from the end zone when it had to settle for the field goal from Kicker and tight end Giancarlo Tufano to bring the score to 31-0. St. Pierre came away with the fourth and final interception and returned it for a 13-yard touchdown for the final 37-0 score. Running back Alex Halkias was the first to get Berlin on the board after a 22-yard catch from quarterback Kevin Dunn for the score with 2:55 left in the first quarter. Halkias scored again just two minutes later. The senior tailback ran for 28 yards to increase the Redcoats score to 14-0 over Bloomfield. As the second quarter rolled around, Berlin immediately jumped the gun with a 22-yard pass from Dunn to Zach Hrubiec. The Redcoats held a steady 21-0 lead over the Warhawks with 9:29 left in the second quarter. Berlin has improved to 8-0 on the season while Bloomfield falls to 7-1. 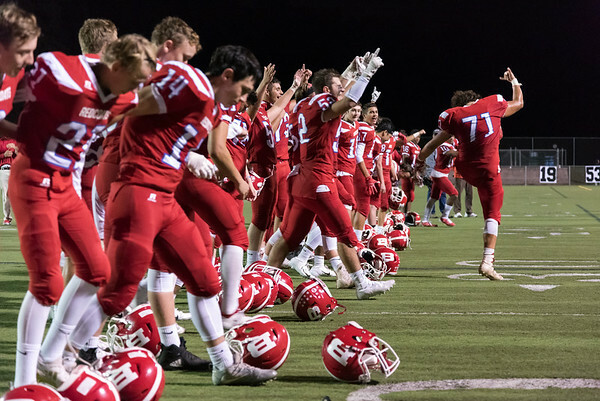 Next week The Redcoats will host Rocky Hill (2-5), who plays this afternoon, next Friday at 6:30 p.m.
Posted in New Britain Herald, Berlin on Friday, 2 November 2018 22:16. Updated: Friday, 2 November 2018 22:24.